cab wins German Packaging Award 2015 in category "Labels, seals and other packaging aids" with Hermes C. The award was presented on FachPack in Nuremberg in September. When it comes to marking chemicals and hazardous substances, GHS and REACH demand new, standardized pictograms. The guidelines apply worldwide. As part of this standardization, imperfectly printed danger symbols, for example blank rhombs, are not permitted any longer. With Hermes C labels can be individually designed and printed. For your application we provide labels and ribbons, BS5609/3 certified as well.
" GHS demanded two-color printing. For us it was important that the bags and barrels are labeled directly in the line taking into account the product speed respectively the speed of the conveyor belt." The white backlight provides good readability. Depending on the installation position, the display may be turned in 90° steps. Simple, interactive menu control, only applicable functions are displayed by the day and night design. Along with the graphic display the menu navigation is easy to understand. For the mounting of the modules it is made of torsion resistant die-cast aluminum. The print position is automatically set after a new label roll has been inserted. The reference value is kept even if the device is switched off. The pressing force can be adjusted according to the label width. 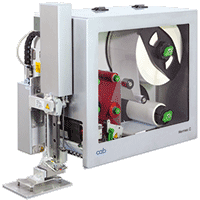 At print head 1 the print head is lifted within the unprinted area and the ribbon is stopped during label feeding. Ball bearing mounted rollers provide high printing accuracy. Due to the swing lever and an integrated brake the labels are unwound with constant tension. The liner of a label roll is completely rewound after the labels have been peeled off. The steering axle enables an easy exchange of the label roll. To protect from dust and damage a cover can be mounted. Stroke applicators with tamp or roll-on pad and vacuum belt applicators. The ribbon should at least correspond with the carrier material. The cover protects the Hermes C from dirt and damage. If the operation panel is not accessible after the printer has been installed, an external operation panel may be additionally connected. There is a slot for a CompactFlash Type I memory card and a USB host interface, which is further available. CompactFlash Type I to store label formats, fonts, texts. Graphics are readable and writable either at the printer or the PC. To be connected at the Hermes C. Start of printing and applying when a product is detected, e.g. on a conveyor belt. Screw terminals enable all control signals to be connected at the Hermes C I/O interface. The warning light in addition to the display indicates the printer status. Via a superordinate control, e.g. PLC, up to 16 different labels can be selected from the memory card. To dispense and remove labels manually a present sensor is needed. In this case, it is advisable to use a mounting foot. The label printer may be mounted with or without a cover. The present sensor PS11 detects when the label is in labeling position. After the label has been removed manually the next label is printed instantly. Printing and dispensing on request via the I/O interface. The hand switch is connected via a cable. The label printer is mounted on the adapter plate. It may also be mounted directly at the production line by means of the adapter plate and the profile. With the bracket the Hermes C can be mounted on a stand or in a production line in any position. With this clamped joint the labeling system can be moved horizontally and vertically. With this clamped joint the labeling system can be moved horizontally and rotated around an axis with a diameter of 50 mm. For mounting Hermes C in a vertical position into a production line. Height and depth can be adjusted by a toothed rack/crank. In addition, the labeling system may be rotated 360° around its axis. The air pressure regulation unit and the warning light are to be mounted on the bracket. For mounting Hermes C in a horizontal position into a production line. Height is adjustable by an internal spindle.